…This is tooth-grindingly awful and heartbreaking, in its way. You Mean That Tyler’s Parents Won’t Let Him Into Certain Areas Of The Tower? We Already Know They’re Powers-ist. Would you let a small kid play in the artillery magazine? There’s areas in MY house where I wouldn’t let him go unsupervised. He has no bedroom or legit place for his stuff. And Toby, who’s powers are more chaotic, can get into them. His only base power is that he can fly. Also: if I was Superman and my wife was Wonder Woman you’d be danged sure that nobody would be casually ripping off pieces of my kid’s DNA for any reason whatsoever. Heck, we wouldn’t allow that *now*. Except Toby is even more a small child than Tyler, given he’s literally just months old and while he has many of Tyler’s memories he doesn’t have the full set and yet he’s allowed full access in spite of that. The only reason Tyler’s been losing access is because he’s not super to satisfy his parents and as such they’ve been marginalizing him steadily as they dote on their ‘real’ son. It’s just more of the ongoing rejection of Tyler by his parents that we’ve seen throughout the comic because he’s normal. It’s odd that they are figuratively turning their “sons” into Batman and Superman. They are emotionally orphaning their birth son, while adopting the one with powers…. You Know Tommy, That That Is Exactly What They Let Toby Do? You know, when you think about it that’s pretty much what we have going on with ALL the kids at PS238. They’re all armed with powers that make them Persons Of Mass Destruction at an age when parents are normally trying to keep their kids away from the kitchen knives, drain cleaner, and guns in the house. They have powers ranging from deadly radioactive blasts to the creation of lethal energy constructs and even the ability to construct planet-destroying devices from obsolete junk scattered around a junk yard. Strangely enough NOBODY seems to really think about this and the many horrible things that can go wrong. Reminds me of a scene from Grrl Power where Halo asks Maxima why they have to have guns when they’ve the powers that they do, Maxima promptly points her finger at a target downrange, blows it up, then points her finger at Halo who is completely confused but freaks when she then points her far less dangerous gun at her. In spite of witnessing Maxima create a massive crater with her powers previously she just doesn’t get the danger that pointed finger carried to her. Halo simply couldn’t get herself to see how having that finger pointed at her was as threatening to her life as the gun even after seeing the powers in action. keep in mind tyler says he doesn’t have access to half the tower ANYMORE. that implies he used to before recent events (toby) and has less access now. Before anyone goes any further, make sure you are ready to make comments about Tyler’s parents, pineapple and others on pizza and How to work HTML. You have been warned. Hey! I happen to think that a good Hawaiian pizza (ham and pineapple) is just yummy. And I’m not in the least radioactive. No cheese or fake cheese is good though. Step away from the pizza and go eat a salad. Man, I hope Tyler can be legitimately adopted by Revenant somehow. This thing with his parents is just painful to watch. The Revenant DOES need a ward to complete the parallel. do you think his parents would even really notice if he handed them the paperwork? I’m sure they would because, at that point, they’re having someone try to take away some’thing’ that ‘belongs to them’. Also, they think the Revenant is a criminal…. It’s funny we make jokes about batman endangering his wards… yet in Tyler’s case the bad jokes would still be on the positive side. That and this reverent does make sure to limit the danger to Tyler while also giving him room to grow if not helping boost his moral. Actually, I’m not so sure about that. They keep forgetting Tyler exists, to the point of doubting it when reminded of him. If a rich mortal guy shoved some document in their faces and asked for permission to take custody of “Tyler,” Ultima would probably think it was somebody asking for an autograph and Sovereign might assume it was just showing proper respect for protocol before removing an intruder from the base. And I still am not 100% convinced that there isn’t something more than pure vile parenting to blame, because the LEVEL of mental block just seems so unreal. But we’ll see. I see someone was raised in a loving home. Trust me, Tyler, while abused by unloving parents, is getting off light on the “abusive parents” angle. I’m not entirely convinced that their indifference towards Tyler is not a side effect of Toby’s powers. Every action Toby takes is nullified in some way by an opposing action. While it’s implied to be because of his powers it’s also entirely possible that EVERY action that affects Toby, superpowered or not, is opposed. Which would mean that just by being accepted by the Powers means that someone else must be rejected. I’m not saying there aren’t worse forms of abuse. I’m saying that I don’t find the forgetfulness believable. Remember, they’re all about their own egos. Making themselves look bad just to abuse Tyler doesn’t make sense. Hmm. Y’know It Is Possible That The Problem Is That They Just Don’t WAN’T To Think About Tyler. It’s Like Someone Who Was Thinking Of All The Fun They Will Have With Their Baby Boy And Then Having A Girl. Neglectful Of Course But It Is Still A Situation That Is Possible Without Some Kind Of Meta-human Intervention. I wonder if them “forgetting” about Tyler is because of Toby. Toby seems to love Tyler, were as Tyler doesn’t relate to Toby. Toby has tried to change reality to give Tyler powers, but he said it didn’t turn out well, do to the nature of his powers. I wonder if Toby is trying to or has tried to improve Tyler’s relationship with their parent but it has backfired due to his powers. Segev you keep holding onto those fatal flaws there in your reasoning. Yes the Powers are all about their own egos and the idea that they couldn’t have anything but a Child Of Destiny (ironically they DID but they aren’t capable of realizing it because they think if he hasn’t got flashy powers and looks normal that he can’t possibly be said Child) BUT such people have no problems with being neglectful because they can easily rationalize anything to fit their narrative AND have no problems with thinking that they aren’t being neglectful at all. They can’t begin to fathom that how they act makes them look awful (for which mind you only we the readers are really privy to that for the most part, even the teachers and principal at the school aren’t fully aware of just how awful they are as they haven’t seen it all like we have) and are certain that there’s nothing wrong with it at all. After all again they think that they’re Beings Of Destiny and that they can only have a Child Of Destiny as they enact the Universe’s Will, if they do something it must be right simply because they did it. You also keep thinking that abuse only comes in a limited number of forms rather than a spectrum and that spectrum includes neglect where the parents reach the point of pretty much forgetting that the unfavorite child even exists. This kind of thing happens in real life to the point it shows up often in both dramas and comedies (like Malcolm In The Middle, Dewey in one episode is so forgotten he manages to arrange, travel to, and win a musical competition all while NO ONE notices he was even gone), the fact that the Powers can barely even manage to remember that they have a son named Tyler most of the time is completely albeit sadly far too real and believable. The problem is that aside from the instance with Ultima forgetting his name, there is no indication they are ‘neglecting’ Tyler. Yes, they treat him horribly and definitely favour Toby heavily, but they are not ‘neglecting’ him. He has his tuition still paid, they put him in that one support group to help deal with his lack of powers, hell, they even made extra invitations for him to give to his non-meta friends (I’m assuming he or Toby didn’t need to steal them, since that probably would have come up). And while I certainly agree that there is a wide spectrum of abuse, it seems illogical to me that they would have this one aspect of it (forgetting he exists) and no other (forgetting to pay for tuition, forgetting to arrange things). Now perhaps the tuition is some automatic thing that regularly gets paid by the computer, but the support group seemed to be new and recent. To Nightmask and others who agree with him, I think you’re misunderstanding what I’m saying. I’m not saying I find their benign neglect unbelievable. I’m not saying I find emotionally abusive behavior (likely unintentional; they’re just so wrapped up in their egos that they don’t notice) unbelievable. I’m saying I find the FORGETFULNESS AS PORTRAYED unbelievable, if it is not caused by some outside actor. I wish I had bold and underline capability here, to emphasize that more. Of course they can rationalize away why their neglectful and even emotionally abusive behavior is not abuse and doesn’t make them look bad. They do that just the same way they rationalized away their physically abusive child endangerment to try to induce Tyler to express powers: their child’s destiny must be met, and OBVIOUSLY all their behavior towards him is meant to bring that about. It’s for his own good, you see. But none of that aligns with forgetting Tyler’s name. I could see it if they kept calling Toby “Tyler,” and then mistook the real Tyler for Toby – the clone. But that’s not what we’re seeing. We’re seeing Ulitma forget Tyler’s very NAME, and questioning HOW TYLER GOT ACCESS TO THE BASE. Shoveling Tyler into an unused storage closet as his “room?” That’s in line with their atrocious behavior. “Oh, he’s off at school so much; he just needs a place to crash when he visits.” (I won’t go into the numerous flaws in that reasoning; the point is that it’s believable given their enormous egos and narcissism.) Even failing to mention Tyler to the new eldritch abomination on their team is believable. What isn’t believable is literally forgetting Tyler exists, to the point that a reminder of his existence puzzles them. If it was, “Oh, right, Tyler, um…yeah, we have a second son we need to do something with,” that’d be one thing. “Tyrone? Tom…? Who are you again?” is what’s unbelievable. It’s even unbelievable as deliberate abuse because it can’t be disguised as “bringing out his destiny” and thus “for his own good,” AND it makes them look STUPID. FOOLISH. BRAIN-ADDLED. None of these are words the Powers would want associated with them. Thus, please note that I am not saying all their horrible, awful behavior towards Tyler is unbelievable. What I’m saying is that their apparent inability to remember him well enough to acknowledge his status as their son, EVEN WHEN REMINDED, is either unbelievable and bad writing, or a hint that there’s Something Else up that’s influencing their minds. Ah. Well, you have bold and italics anyway…. To those who think that Tyler’s parents were better before Toby came around — remember, they told PS238 to expose him to any cosmic rays they came across on the field trip. From the very beginning, they cared more for potentially activating their son’s powers(despite not having evidence that Tyler had latent powers) than for their son’s safety. They might have been a little better at remembering he existed, but they were never great parents. Rivalyn everything Toby does with his POWERS gets some kind of countering action, not every single action he engages in. His giving someone a fruit cup isn’t going to be countered by something negative, not unless he used his powers to do it and even then it wouldn’t generate anything big. If he uses his powers and they’ll lend towards something more orderly resulting something chaotic happens and vice versa. Say, why isn’t underline allowed? I can see that happening soon after his DNA is misused for access to less sensitive areas, and that access permission gets revoked. Anyone got an ID on the one with the orange cape? And Cecil has arrived as well, right? Maybe he’s the one in the orange cape. Maybe he’s the off-panel one saying “There you are.” I assume that’s what Stephen meant. On the other hand, Cecil doesn’t seem the type to just announce himself like that. Especially in front of Ron. Belated realization: Ron’s powers can’t be X-Ray vision (unless they’re new since the last time he was with Moonshadow), since that would have let him see through Moonshadow’s helmet and recognized Tyler. Not necessarily. He already knows Tyler has a mysterious Identical twin brother, remember. Moon Shadow could be another. Man, that makes way too much sense for comics. He’d have at least – probably with sour suspicion – asked Tyler about it. Either out of friendship and trying to protect Tyler from whatever the bad luck Moonshadow is up to, or out of a sense of betrayal that Tyler wouldn’t have told him. And that’s assuming he DOES automatically guess that Moonshadow, despite looking like Tyler, isn’t Tyler. He’s too bitter at Moonshadow and cool with Tyler for me to buy that he associates them in any way, in his own mind. Its already been speculated that Tyler has “lucky boy” and “nondetection” powers strong enough that his parents forget him. While I kind of like this just from the not having to hate his parents everytime they show up, I hope that Tyler really doesnt have powers, other than his Revanant skills. This world is badly in need of someone to change the attitude of the capes. I agree; I don’t think it would do the story any good to give Tyler himself powers, even subtle ones. His schtick is very much the “action normal” who’s caught up in big things. He’s already got “powers” in the form of being important to destiny. He’s practically the Chosen One. Giving him overt innate powers would feel…off. I maintain that it seems like his parents’ forgetfulness is from some external source that we’ve yet to see. It also strikes me that the way his parents are treating him is only marginally within the widest interpretation of Toby’s “don’t reject Tyler” wish. (Or whatever you call it when he warps reality with his powers.) Given what it cost him AND the Principal, that makes my suspicion that Something Else is interfering feel more well-grounded. Of note is that we’ve not seen intrusion from the “Power and Glory” plot thread for a bit, now. I wonder how that will inject itself into this super-party plotline. Toby never made any such wish/reality alternation, he helped the Principal by removing his curse in exchange for the Principal arranging things with Tyler’s parents so that they could be brothers and handle all the paperwork to cover for his existence. Said help meant the Principal couldn’t gain his Redemption for his past criminal acts to become President and that Toby would never have the best friend he could have ever had. There was never a ‘make Tyler’s parents accept Tyler’ wish and if there had been we obviously would NOT see them instead doing the opposite, any negative consequences from such a wish wouldn’t be be so contrary to the actual wish. The forgetfulness of Tyler’s parents meanwhile is completely in keeping with normal human behavior for such personalities with the huge flaws that they have, there is nothing to support the idea that some outside agency is responsible all the evidence shows that they’ve had those mental issues for his entire life and they’ve simply gotten worse solely do the creation of Toby, which while he could be considered an outside agency it’s purely a result of him being the realization of their Cosmic Destiny delusion and nothing to do with super-powered mental alteration of the Powers. They’re just awful parents, accept that. Segev, I mostly agree, but I don’t think you have to look for an outside influence. Ultima’s specific forgetfulness about Tyler seems to fit the description of Localized Dissociative Amnesia. It usually manifests in cases of trauma, such as an assault victim who may have no memory of the assault but can remember the rest of their day perfectly well. 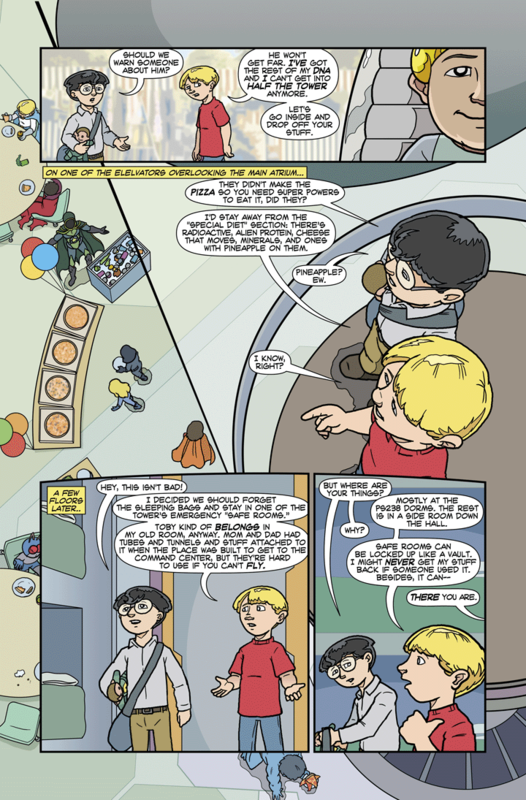 I suspect that eventually the existence of Toby forcibly presented Ultima and Sovereign with the fact that Tyler was not going to become a super-powered hero and fulfill the destiny they expected their (original) son to fulfill, and for Ultima at least, it was too much cognitive dissonance to deal with. Essentially, the clash between reality and his prejudices and ego was so “traumatic” he gave himself a mental disorder. Probably just a temporary one, assuming Tyler was enrolled in the support group by both parents and not just Sovereign. The way they’ve been treating Tyler lately – with the support group, EDL security, and turning the sleepover idea into a super-kid slumber party – could add up to them getting better, worse, or mostly the same, depending on how you interpret it. I’d suspect “mostly the same”. Do you honestly think Revenant wouldn’t have thought to make the mask lead-lined? I keep waiting for a villainous kid to comment on how evil his parents are. You mean something that would be suitable for the ‘Your approval fills me with shame’ trope? Villain kid’s all envious and gushing about how evil the Powers are? Sadly they’d totally missed the point and learn nothing from it. The Von Fogg’s are far more loving parents in comparison. More like “dude, your parents treat you like crap. If you were a bad guy, I’d help you get back at them.” Maybe a dash of sympathy. Tyler does look to be enough of a sad sack due to his parents that even the villains would have sympathy for him. Heck if you look at some of Zodon’s comments HE actually has concern for Tyler, he just doesn’t show it in the way that the good guy protagonists do. Seeing this opinion made me remember the incident in which Zodon raised Captain Clarinet’s cape up the flagpole and sent that runaway jet towards that general airspace. Any other supervillain would have taken the opportunity to amplify CC’s phobia weakness, to the point that CC would devolve into a Meatball of Anxiety (TM) at the thought of having to pursue a fleeing foe through the air. Instead, Zodon arranged to BREAK CC’s phobia. What does that say about Zodon’s character? Well Stephen that was more just Zodon trolling Ron, he didn’t particularly expect it to actually help free Ron of his phobia but he knew it wasn’t a prank that would particularly hurt anyone and when you look over the Alternate Omaha storyarc Zodon basically reveals that his actions are what can be expected from an extremely bored and unchallenged active mind like his, acting out for attention and to occupy himself. So he’s mostly selfish but not necessarily an actual villain and will do good deeds when properly motivated. Odds are we’ll see him shape up more and more into a hero as the story goes along if it manages to advance enough years. If it makes you feel better, I like pineapple and mushrooms (and/or ham) on pizza. Mushrooms are okay (preferably with sausage and pepperoni), but pineapple can go jump in a volcano. Wrong. Pineapple is absolutely fine on a pizza, as long as it is accompanied by ham. In fact, pineapple is the closest thing to anything healthy I will let on my pizza. Mushrooms and other vegetables (Including tomatoes) can go jump in a hot gyser. You Sir Forget Sir That Tomato Sauce Sir Is A Key Ingredient Sir On Pizza Sir. Tomato sauce and tomatoes-as-toppings are actually quite different. I usually get extra sauce on my pizzas. I am not a huge fan of tomatoes as toppings. Pineapple, mushroom, olives, green pepper, garlic & anchovy pizza. The food of the gods. 1. I’ve never had fish on my pizza. The only time I have had anchovies is on a salad, and that was a long time ago. Are anchovies on a pizza any good? Sad but probably true. Also, 3. What is HTML? Anchovies and pineapple go very well together on a pizza, it’s the sweet vs the salt, the umami vs the sour, a great combination which goes well with a good tasty cheese. On my pizza, I also like bacon, tomato, olives, capsicum, prawns, goats fetta cheese, sharp cheeses such as aged cheddar, ham, cabanossi, mushrooms, onion, garlic and even egg. Yes, all at the same time, I’ve never understood the “American” pizzas you can get with two or three ingredients on them. Weird. If it hasn’t got at least six ingredients, or a lot more, I feel gibbed. And yes, I’m an Aussie, as you can tell from the prawns (“Shrimp” is an American food term, we don’t use it for small edible crustaceans, just for describing short humans); and also from the bacon and egg. Alas, you nearly had me convinced regarding Tyler’s execrable parents; but if you like pineapple on your pizza we can never be allies. I often feel like I’m the only one who doesn’t like pineapple on pizza, at least among my friends and family – they’re all fans of Hawaiian pizza (pineapple and ham). My three favorites are ultimate meat (sausage, ground beef, ham, bacon, and pepperoni), chicken with white sauce, and seafood (shrimp, crab meat and garlic). Those all sound amazing. Never mind anyone who disagrees, meat is amazing, although I do like Hawaiian (See above comment). For some reason, I’ve never actually [i]ordered[/i] pizza with pineapples and ham, but the few times I’ve been somewhere where it was offered, I [i]have[/i] enjoyed it. Anchioves, now, they’re just evil incorporated. (Let’s see if the italic commands worked. Need to use angle brackets – < > – instead of square brackets – [ ] – to make italics and bold work. Yeah, just screwed it up! Oh well, I figured it out now! As far as Tyler’s parent’s are concerned. I do think they’re terrible parents, but the forgetting completely factor does sound odd to me. To which we can add a third discussion – available HTML tags for comments. Can I point out that this is a great continuation of Tyler’s “being prepared” trope? We see him carrying a backpack with a flashlight in it and Guardian Angel says, “Do you alway carry that around?” Whereas Tyler mentions “I’m finding it best to be prepared.” Well, here he is, doing it again. The training is settling in well. I’m not following you, I’m afraid. To what specifically are you referring as continuing Tyler’s “be prepared” trope? Way early in the strip. Guardian Angel leads Tyler, Zodon and Bernard on a trip through the school without tripping the security monitors. They end up in a section of the school that turns out to be an abandoned space station (a haunted one, no less.) At one point, Tyler digs through a backpack he’s carrying around for a flashlight and tells GA “I’m finding it’s best to be prepared.” I think not trusting the safety room and keeping his stuff “down the hall” shows him continuing to follow the prepardness trope. Ah! Okay; I was trying to find him being “prepared” with a backpack here, and wasn’t seeing it. I was missing that you were referring back to earlier strips for the backpack. Here’s what’s probably a dumb question. How did you use the “” in the left column without triggering the effect? Sorry, they didn’t show up. How did you create the angle brackets without triggering the action? The comment system strips out <SPAN> tags completely. Ah well. I tried. I hope those last two don’t work. So none of the obsolete ones work (except <ACRONYM> which Owlmirror already documented below). Not sure how I missed <DEL> last time. Notice from the story Toby tried to give Tyler powers, it messed up and he did a reset. I just wish that the story would address this with Toby and Tyler directly saying their thoughts to each other/experiencing it. …And make sure to not screw things up. Hmmm. What happens if you put the ͟ tag before each letter instead of after? It’s not a tag, it’s an actual Unicode character — “Combining Double Macron Below” (or “Combining Double Low Line” for the previous attempt). Okay, that was strange. The tag is “& x 3 5 F ;”, and I used “& a m p ;” for the ampersand in the first line which should have kept it from displaying the underscore, but it did it anyway. Since as best I can tell, it does pretty much the same thing as <abbr> (in terms of appearance) and takes longer to type. Mnemonic convenience, probably. Somebody in the standards-writing crew kept thinking it was “acronym” and couldn’t remember “abbr.” At least, that’s my guess.